A blog about solitaire games and how to design them. I'm your host, Morten, co-designer of solo modes for games such as Scythe, Gaia Project and Viticulture. Just like many other players I ignored Patchwork for a while after its release. It just didn´t look appealing to me. The theme didn´t grab me at all. Eventually it was the app that made me realized what a brilliant design it is. The button and time board concepts are great. 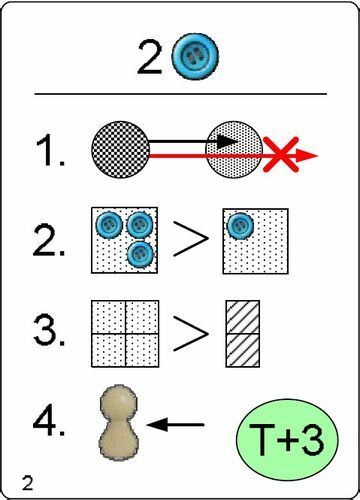 You´re juggling three resources: Buttons, time and space. The set of shared tiles could also be considered a dwindling resource with various costs in the three other resources. The way those resources are interwoven is new and fresh and exciting. In addition, you have to look for the right shapes and which ones your opponent might be going for. Furthermore, with careful planning you can manage to get two or three turns in a row. This is one of my most underestimated games. After playing the App I immediately bought a physical copy but unfortunately didn´t find the right people to play it as often as I wished. I wished someone would create an Automa for it. Fast forward. Essen 2016. Cottage Garden was released. Then Morten bought a copy, so did I. Some weeks later, the Morten presented an Automa for it. I tried it and it worked fine. But it didn´t grab me. That was not the Morten´s fault. I just found Cottage Garden pretty unexciting. It was missing almost everything I loved about Patchwork and it quickly gathered dust on my shelf. So, I wasn´t too much interested in the Automa version, either. But almost instantly I (and our third Automa Factory member [David Studley]) tried to push the Morten into adapting this to Patchwork. Unfortunately, the Morten neither had the game nor the time to do so. It looked like I had to do it myself. My first version adapted some of the Morten´s Cottage Garden concepts. Instead of placing the Automa´s patches on its quilt board, they were placed beside it. A marker on the quilt board counted the squares the patch would have covered. It was moved in reading order along the empty board and when it reached the end, the Automa was considered to have fully filled its board. Other than that, my first Automa behaved much like a human player: It gained and spent buttons, it passed when it couldn´t afford a tile, and when it could afford more than one tile it made its choice using a fixed tiebreaker list. 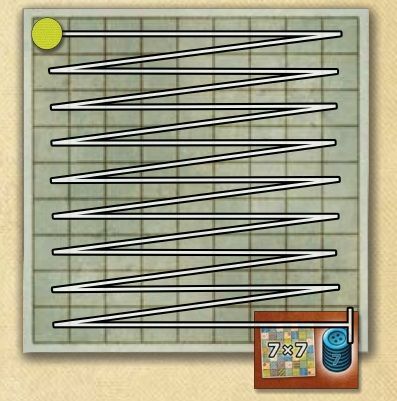 The special tile you get for completing a 7x7 area was placed on a specific space on the Automa´s quilt board, and when the marker reached it, the Automa was considered to have created a full 7x7 area and claimed the tile for itself. I played a couple of times and sent my draft to the Morten and David. They both showed interest, but were way too busy to invest more time in it. But the Morten mentioned he might be interested in developing this and offering it to Lookout, the German publisher of Patchwork. He asked whether I´d be willing to wait till he has some time to dive into it? Having the Morten´s interest boosted this project from a nice little side project I´d just have posted on BGG to something I took more serious. By that time (November 2016) I have already worked a lot with the Morten and David. I know, how they think and I have learned a lot about Automas. Priority number one is that Automas must be as simple to handle as possible. Looking at my version and found that, although I liked how human-like the Automa handled the buttons, fiddling with them each Automa turn (gaining, spending, counting) was too much work. Patchwork has quick turns, so the solo mode should be similarly quick to handle. Could I get away with the Automa not caring about buttons all? How would that work? More important, how would scoring look like without buttons? I tend to do a lot of statistics when designing. I kept track of all kinds of numbers from my playtests. One day, when I looked through my spreadsheet I realized that the number of buttons on patches the Automa gained throughout a game was pretty close to my average score.Could I use that as the Automa score? I created a deck of cards that gave the Automa a virtual number of buttons to spend on its turn. This was less realistic, but easier to handle. You flip over a card, it shows a number of buttons. All available patches with a cost equal to or less than that are eligible for the Automa to take. Give the patch to the Automa, discard the card, done. By that time the tiebreaker list was still fixed and unchanging. Next, I got rid of the Automa´s quilt board. It only tracked the spaces needed for the Automa to gain the 7x7 tile. My spreadsheet also included my position on the time board at the moment I managed to claim the 7x7 tile. I took an average, placed a marker on that space of the time board and tossed the Automa´s quilt board. When its time marker reached the marked space before I got the 7x7 tile, it claimed it. This was the slimmest version of my Patchwork Automa. 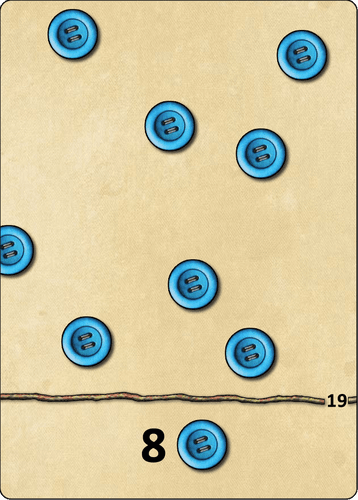 The scoring worked differently now, it scored the number of buttons on its claimed patches (plus the 7x7 tile). It was different than the regular scoring, but it allowed me to get rid of unnecessary and fiddly elements. One of the Morten´s biggest fears is that players will find a way to game one of our Automas. We had more than one discussion where he didn´t want a player to have a specific information of what the Automa might do on its next turn. Most of the time he´s right about that. Every now and then I have to remind him that that specific information would also be open information in a real game. It´s always an interesting fine line. The fixed tiebreaker made the Automa pretty predictable. Sure, you wouldn´t know how many buttons the Automa could “spend” on its turn, before you drew the next card. But you could easily tell that IF the Automa had, let´s say 10 buttons to spend, it would go for the tile first in the tiebreaker list. So, I removed the list from the rules and gave each card its own list, mixing up the tiebreakers differently to make them unpredictable. A good side effect was that I could now adjust the tiebreaker list to the number of buttons the Automa has for its turn. On cards with high numbers the first tiebreakers tended towards “patch with most buttons” or “largest patch”, while cards with low numbers focused on getting double turns (patch that costs least amount of time). Having the Automa´s button numbers on cards added a level of unpredictability I liked. Each turn started with a card flip and a surprise. On the other hand, I realized that this didn´t match the real game where the number of buttons your opponent can spend on his next turn is open information. More experienced players might miss this tactical element. I talked to the Morten about it and made a version where the button numbers were also shown on the back of the cards. You always knew the Automa´s buttons for its turn. I found it boring. The entire element of surprise and tension was lost. We decided to postpone this for beta testing. The system worked pretty well. But after a dozen more playtests I realized that there was not enough variety in the Automa´s scoring. It always scored around 22 points, with a deviation of around +/- 7 points. Real player´s scores can reach from -20 to +45 points and even beyond that range. I tried to introduce difficulty levels by changing the card distribution. Three cards were the key here, one with 0 buttons, one with 4 buttons and one with 10 buttons. In a regular game you´d leave out the 4-button card. In an easy game the 10-button card. In a hard game the 0-button card. Looked good on paper but only marginally changed the Automa´s scoring range. I tried totally different card sets with different button number distributions. I introduced different spaces on the time board where the Automa gains the 7x7 tile. None of this worked well. We had a too perfect Automa with too less variety in scoring. Then the Morten sent me a suggestion: Each time the Automa´s time token crossed an income button icon on the time board it´d gain a number of buttons equal to the buttons shown on the patches it already gained. I didn´t like it. First of all because I was so happy that I could get rid of any kind of button income. Second, because the number of buttons on gained patches is nothing I had control of. It would be pure luck if it worked. But on the other hand, the Morten was right. We needed a “random” modifier to stretch the Automa´s scoring range. And a trigger when to apply it. 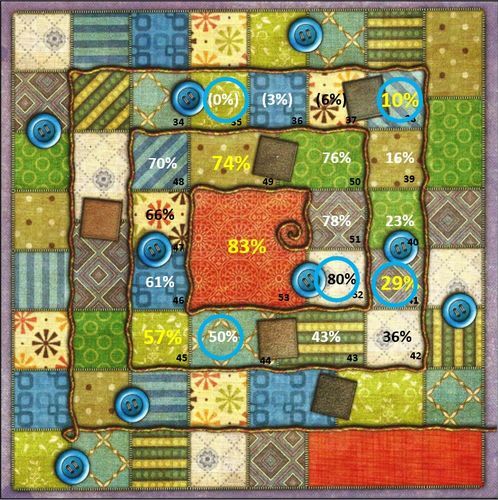 I divided the overall Patchwork scoring ranges into 4 sectors from beginner to hard, set a center number for each range and figured out a preferred +/- deviation. It was somewhere around +/- 7. I kept the Morten´s trigger suggestion (passing an income icon on the time track) and added a new value to each Automa card. This would give the Automa somewhere from 0 to 5 buttons when it crossed an income icon. The distribution needed to be so swingy that it creates a random but still controllable element. A possible bonus from anywhere between 0 and 15 throughout a game. That would be my +/-7 deviation. If this worked well I could even add four different values on each card to use for each of the four difficulty levels. It took a ton of iterations for the distribution on the cards, but in the end, it worked. The Automa´s score was less consistent now. For me it was the first time in a design where something was too perfect and needed to be made artificially worse. Interesting experience. There was a good side effect to the new system. When the Automa had lots of buttons to spend it most likely gained a good patch. In such cases I didn´t want to give the Automa additional buttons if it crossed an income icon. So, I put 0 button income on high button cards. On the low button cards, where the Automa was likely to gain a weak patch, or even needed to pass, I added the high numbers. This was an unexpected lever to work with and added a fun little twist. The downside was that we added a bit more fiddlyness (is that a word?) back to the system, dealing with button income for the Automa and having to count them for scoring. And of course, since we were now adding 0 – 15 buttons to endgame scoring the basic score needed to be lowered. I always calcululated the score of all (by then) 4 difficulty levels within one game played. Even better, I realized I could cover all difficulty levels just by adding different variables at the end of the game. This had two advantages. Only one income icon on the cards, instead of one for each level, and difficulty adjustment had no in-game effect you need to remember while playing. In addition, I introduced different spaces on the time board at which the Automa would gain the 7x7 tile. In the meantime, the Morten finished some of his other projects and had more time to join in. He had already contacted Lookout games, and they showed interest. We knew this was not something that justifies a new edition of the game or a stand-alone Automa “expansion. But Lookout publishes their own magazine “Ausguck” and talked about publishing our Automa in one of their issues. That was motivating. We decided to start beta playtesting. I´m so glad the Morten has enough attention on BGG to gather a playtester pool quickly. I remember trying this myself for other projects and mostly ended up with a playtester pool of one or zero. We did 3 waves of playtesting, starting with a small group of around 10 players. I was very, very, VERY happy with the initial feedback. The Automa got good ratings right from the start. And it looked like I hadn´t overlooked any major game-breaking factor. What a relief! After about 80 reported games we had enough data to start tweaking the difficulty levels. Up until playtesting I was more or less the only one who had played this excessively. All levels were more or less based on my personal skills and playing style. We set target numbers for 4 levels and added the compulsory “brutal” level 5. But first we had to deal with another problem: We kept track of how often players would gain the 7x7 tile. This tile feels pretty crucial in the game. Unless no one gets it, it´s a 14-point swing. One player gains 7 points and also denies the other player the option to gain those points himself. Personally, I think this tile awards too many points. 3 or 4 points would be my preference. But as an Automa (or any other kind of solo version) designer you should never change any original game concepts or rules. The problem was, that the ratio in which players got the 7x7 tile did not match the win ratios of the games. We needed to adjust the 7x7 win ratios to our desired difficulty level win ratios first, before we tweaked scoring. I took our playtest data with the 4 positions of the 7x7 marker, added them to a time board and filled the spaces in between with interpolated values. Based on this we set new positions on the time board. Again, we needed to check our scoring variables (7x7, buttons gained, empty patches gained, patches with buttons gained, number of buttons on gained patches). Luckily, we found combinations that – on paper – would provide the win ratios we were aiming for. In the meantime, Lookout had posted some hints about a Patchwork Automa on Facebook. We started another wave of playtesting with the new variables and phew, this seemed to work well. 50 more playtest results later, collecting results and crunching numbers we were finally there. I cannot stress enough how valuable playtesting and playtesters are. Without them you´ll never be able to get 130+ games played with different approaches, skill levels and tactics within a couple of weeks. I´m very grateful to each and everyone who contributed here. Without you, this Automa wouldn´t be as solid and balanced as it is now. Sounds like a cliché? Well, yes. But it´s so true. Version 1: Put the number of buttons on the back of the cards, so players can see them before the card is drawn. This came with another problem: There are hardly any cards with the same button value. If a player memorized the cards, based on their button value, he could derive the full card from the value shown on its back. Version 2: Leave the numbers on the front of the cards only, but on an Automa turn it will use the button number of the topmost card of the discard pile. In other words, the previously played (and discarded) card will show the button value for the next turn. The player wouldn´t know which card will be drawn next and what tiebreakers might come. The huge downside here was that the button value was suddenly disconnected from the tiebreakers and button income value. All the interaction between these factors was lost. In the end we decided to use version 1, changing the button values, so that there are at least two of each in the deck. While players could still try to remember which cards have shown up, this would make it harder for them. By that time, we knew Lookout is going for a magazine publication, which allowed up to 24 cards. And since playtesters seemed to be split about having this tactical variant over the non-tactical variant, we simply decided to add both. A few cards and a sheet of rules. 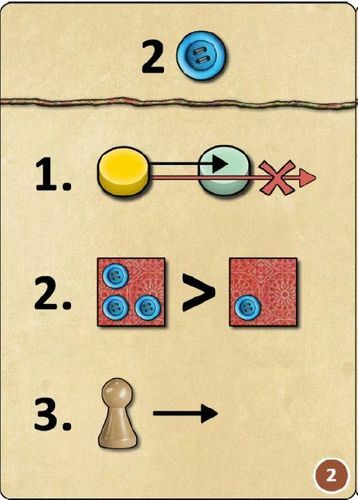 Looks easy, doesn´t it? It´s been the first time I had the opportunity to go through such a meticulous development process with one of my own ideas. I´m glad it was “only” a “small” project. I learned a ton. And I´m even more happy that it´s finally published. Lookout did a great job adapting the cards and rules to the original Patchwork style. Now you can enjoy it and play this fantastic game solo. Have fun quilting! Thanks to the Morten and David.